The Rev. Curry Pikkaart launched A Nation Under God: Reflections from Jeremiah, a discussion of the biblical basis of the concept of “one nation under God”, as reflected in the Book of Jeremiah. The Rev. 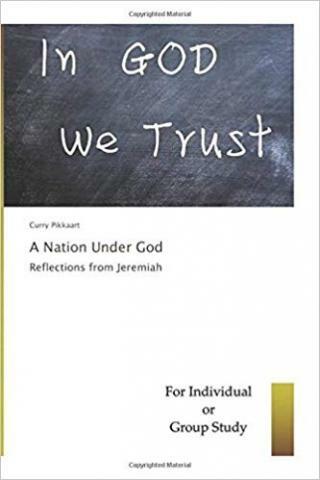 Curry Pikkaart, a retired pastor, successful author and ministry coach, launched A Nation Under God: Reflections from Jeremiah, a book discussing the biblical aspects of what exactly it means to be “one nation under God” by focusing on the Book of Jeremiah. The book aims to answer a series of relevant questions such as the meaning of being a nation under God, the implications of accepting this mission, and many more. More details can be found at https://www.amazon.com/Nation-Under-God-Reflections-Jeremiah/dp/0692126708. The words “one nation under God” have been added to the Pledge of Allegiance of the United States in 1954 and have caused a great deal of controversy. His latest book aims to explore important questions related to the controversial phrase, including its meaning, the responsibilities that come with it, and the biblical foundations for the concept of “a nation under God”. The book focuses on the Book of Jeremiah as the foundational text for a nation which accepts the guidance of God as its ultimate guiding force. Choosing the biblical story of Jeremiah was motivated by the unique mission God gave him. After years of Israelite rebellion, Jeremiah was assigned the difficult task of revealing the sins of the Israelites and calling them back to accepting God’s guidance and rule. The book explores the teachings of the Book of Jeremiah and its relevance for the modern meaning of the “one nation under God” concept as applied to the United States.